A pellet gun of this type was originally purchased by us with the idea of using it to test our ECOSLUG Muzzleloader Bullets indoors. This did not work out, because the Seneca/Sam Yang Air Rifle has a bore that is very “tight” for .50 caliber. The bore diameter was measured at .494/,495 inches, which is much too tight to get an ECOSLUG bullet/sabot combination down the barrel. However, we were very impressed with the Seneca/Sam Yang Air Rifle design. Although we at P-Bar Company LLC take the USA’s huge trade deficit seriously (see the “About Us” tab on our website) we need to give credit to the South Korean makers of the Seneca/Sam Yang PCP air rifle-they did a great job! And, it must be remembered that South Korea is a good ally of the USA, and faces an ongoing difficult situation with North Korea. As nice as the Seneca/Sam Yang is, we were amazed that there were NO LEAD-FREE pellet options! One of the benefits of an air rifle is the ability to shoot it indoors, or in areas too crowded for normal firearms. Yet, these are precisely the areas where a Lead-Free pellet has the most benefits! The indoor shooting of Lead Pellets can give off small amounts of Lead Dust. And who wants to shoot lead pellets into a garden or yard, where LEAD CONTAMINATION could be a concern? To meet this “VOID” in the marketplace, we have developed a Lead-Free pellet for use in Seneca/Sam Yang Dragon Claw .50 caliber big bore pellet rifles. It can also be used in other .50 cal. big bore air rifles with a .494/.495 bore diameter; HOWEVER, THE .80” OVERALL LENGTH OF THIS PELLET COULD BE A PROBLEM FOR SOME AIR RIFLES DUE TO THEIR LOADING PORT DESIGN, OR IF THEY HAVE A MAGAZINE THAT DOES NOT ALLOW A PELLET OF THIS LENGTH. 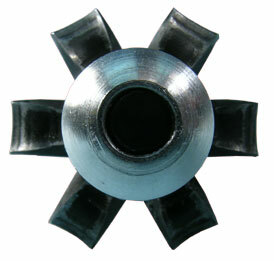 The pellet consists of an outer shell made of Aluminum. The inner core and retaining cap are made of steel to add weight. These are the same materials used in our ECOSLUG muzzleloader bullet (see the “Non-Lead Test Report” website tab). Although the Aluminum contains .01% Lead by weight, this falls well below the 1% Lead by weight Lead Limit used by the State of California for a Bullet to be considered “Non-Lead”. Because a Non-Lead Bullet can be used in areas of California that prohibit Lead Bullets, for all practical purposes the terms “Non-Lead” and “Lead-Free” can be used interchangeably. The Aluminum outer shell of the Pellet does not contact the rifle bore. 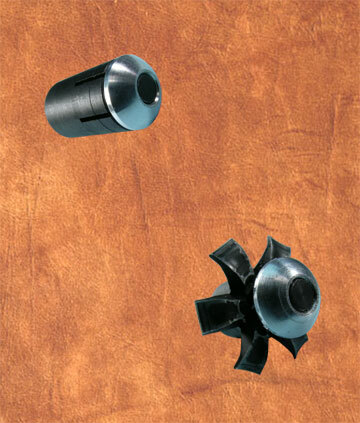 The “interface” between the Pellet and Bore is accomplished by use of two “Buna-N” O-Rings. The O-Rings can flex and conform to the Air Rifle Bore, while still imparting spin to the Pellet. As opposed to the higher pressures of firearms, the relatively low 3,000 PSI pressure used in Seneca/Sam Yang PCP air rifles allow O-Rings to be used. The weight of this pellet is 145 grains. On our indoor 10 meter range, the accuracy results were excellent, because each pellet is precision made on a CNC lathe. This allows the dimensions to be held to very close tolerances, which is especially important for the O-Ring Grooves. At this 10 meter range, we have found that the point of impact is very similar to that of the heavier Lead Pellets sold for use in .50 Caliber Seneca/Sam Yang air Rifles.